An American contractor for the UN who was detained at the airport in Yemen's capital Sanaa last month has died, the US state department has said. Spokesman Mark Toner could not give a cause for John Hamen's death. Mr Hamen and a colleague - reportedly also American - were held by airport authorities after they arrived on a UN aircraft from Djibouti on 20 October. They were working for a company that managed UN facilities in the city, which is controlled by Houthi rebels. At least 5,600 people have been killed in seven months of fighting in Yemen between the rebels and forces loyal to Yemen's government, backed by a Saudi-led multinational coalition. Mr Toner told a news conference in Washington on Tuesday that he could only confirm that Mr Hamen had died in detention in Yemen. He said he did not have a "determination" on the cause. Mr Hamen was believed to have been held by the Houthis, he added. UN spokesman Stephane Dujarric told the AFP news agency: "We have been informed by the state department of the death of one of the contractors." "Obviously we send our deep condolences to his family, to his wife, to his children," he added. "The other contractor, as far as I understand, remains in custody, but I have nothing to share with you as to discussions that may be going on," Mr Dujarric said. Mr Toner said he could not confirm that another individual was being held. Unnamed UN officials said earlier this month that Mr Hamen was detained along with another American, but the UN did not confirm their nationalities at the time. 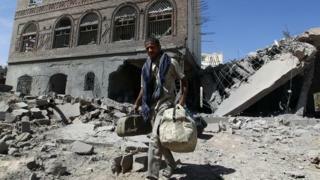 The UN is trying to broker a ceasefire in Yemen, but has made limited progress. All major combatants have agreed to implement UN Security Council resolution 2216, which calls on the Houthis and allied army units loyal to former President Ali Abdullah Saleh to withdraw from cities and hand over weapons they have captured.